You can vote in Teton County if: *You are a U.S. Citizen; *You are at least 18 years old; *You have lived in Teton County for at least 30 days; and *You are registered. However, in order to vote in elections that are not county-wide, you must live within the boundaries of the specific zone or taxing district holding the election. How do I vote early with an Absentee Ballot? Anyone may vote by absentee ballot prior to election day, but must complete a written application to obtain a ballot. Absentee ballots are generally available 45 days before an election. If you want to receive your ballot through the mail: Call 208-354-8780 or click here to obtain an absentee ballot application. Complete and return the application to the County Clerk by mail or fax. You will be mailed an absentee ballot with instructions. Be sure to start this process early enough to allow time for multiple mailings! If you want to vote early at the Courthouse: Go to the Courthouse and complete an absentee ballot application. You will be given an absentee ballot to vote before leaving the courthouse. Unregistered voters may register and vote at the same time, provided that ballots are available. You must bring a photo ID or sign a Personal Identification Affidavit. What types of Photo ID will you accept? A poll worker must verify that the picture and name on the ID matches the voter. The name on the ID must also match the name on the voter registration list. Common abbreviations and nicknames are acceptable, but a name change require the voter to re-register. If you aren't able to show a required photo ID, you may sign a Personal Identification Affidavit. Can part-time residents choose to vote in Teton County? You can register and vote only in the state and county of your primary residence. This is where your home or living quarters is located, and to which, whenever you are absent, you intend to return. If you are uncertain which residence would be considered "primary," please consider factors such as where you work, where your vehicles are licensed, where you pay taxes, and where you claim a homeowner's exemption. You can only vote in one precinct. You cannot vote on state or national issues in one place and on local issues in another. 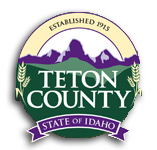 There are seven geographic precincts in Teton County. Please review the precinct boundaries shown on this map (click to view). All boundaries follow the centerline of a road or creek. Precinct #1 votes in the Gymnasium at the LDS Church located at 6181 S. Main in Tetonia. Precinct #2 votes in the Commissioners Meeting room in the Courthouse located at 150 Courthouse Drive in Driggs. Precinct #3 votes at the Driggs City Center located at 60 S. Main in Driggs. Precinct #4 votes at the Driggs City Center located at 60 S. Main in Driggs. Precinct #5 votes in the Commissioners Meeting room in the Courthouse located at 150 Courthouse Drive in Driggs. Precinct #6 votes in the Gymnasium at the LDS Church located at 87 East Center in Victor. Precinct #7 votes in the Gymnasium at the LDS Church located at 87 East Center in Victor.